Discover Portland City on this 2.5-hour tour with hotel pickup. See Pioneer Square, Rose Gardens, Pittock Mansion and more. Enjoy a guided visit through Portland's historical neighborhoods. Portland is the largest city lying between San Francisco and Seattle and when compared to those cities, Portland’s environment is not as fast-paced; instead it has a more laid-back, smaller town feel to it that has been created by planning policies. 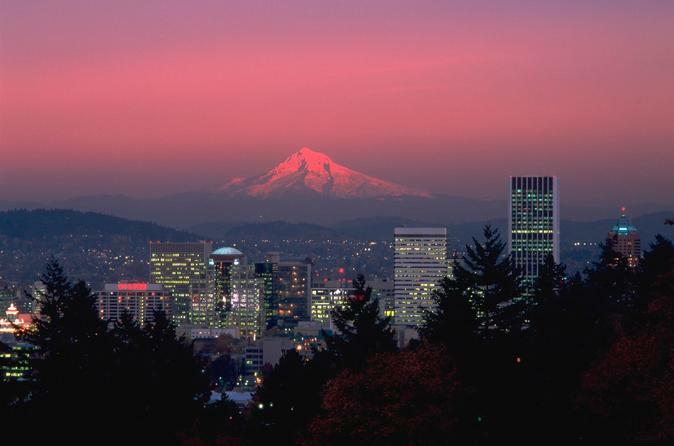 Portland, however, is still a city just shy of 610,000 people with a metropolitan area population of about 2.4 million, and as such has its fair share of cultural amenities, including an impressive music and arts scene and one of the largest collections of zine and independent publishers of any city in the nation. The food, beer, wine and spirits scene is the best on the West Coast and the city has gained a reputation as the Beer and Food Cart Capital of the World. There are now more than 70 breweries in the Portland area and over two hundred wineries within an hour drive. The city’s development hasn’t yet become overwhelming, in large part due to the progressive urban planning culture here. The city boasts the most extensive light-rail and streetcar system in the country. However, in recent years Portland’s growth has started to catch up with daily living, such as having some of the worst traffic congestion in the West, a rising cost of living relative to wages, and a relatively high rate of underemployment for those under 40. It is, however, still the least expensive large city on the West Coast.